We are lights out on the 40 today and for the next 2 days. With the fish going through TTM, the tank is fish less of course, and there's a slight algae bloom right before I took them out of the tank. Why not utilize the time of no feeding and go lights out and water changes to get rid of this algae. 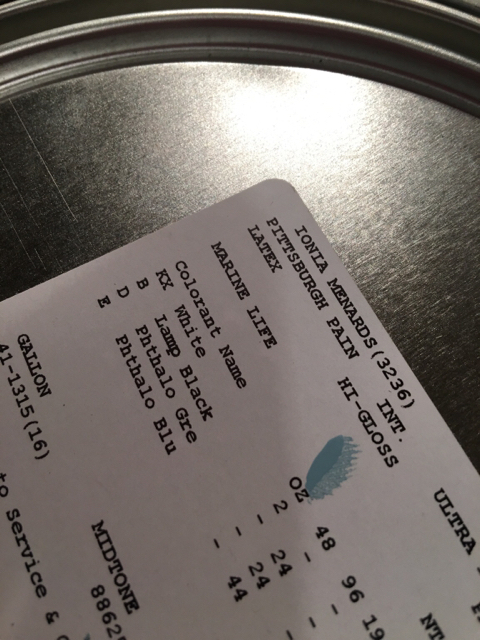 Check out this paint color (name) for the fish room, didn't even know the name until after I chose the color by sight. Today's progress, laid out the flooring to let it form to the room, will finish laying tomorrow. 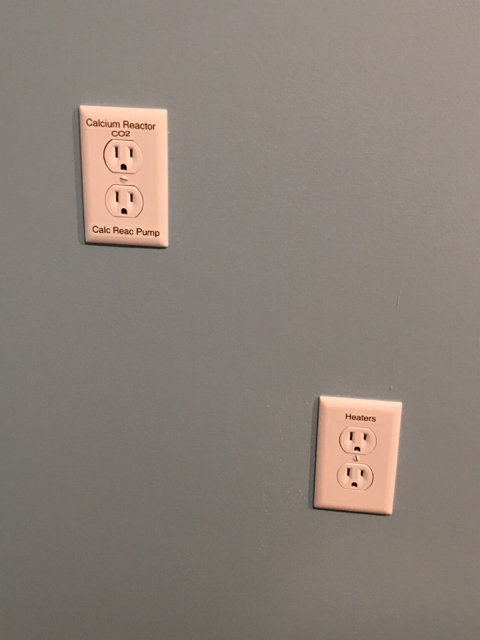 Outlets are finally done and labeled. 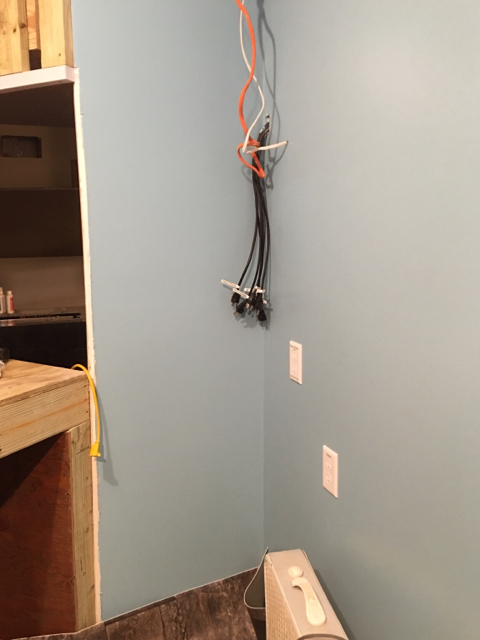 The picture of all of the cords hanging, that's how we 'wired' the room. Each cord goes to an outlet. Then these will be ran into a cabinet on the small wall. 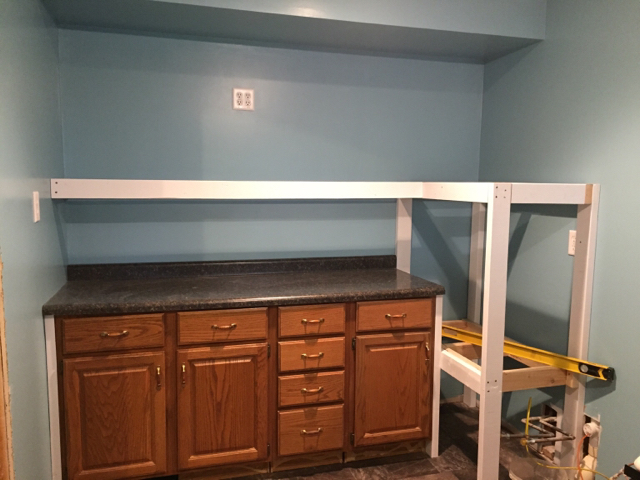 Cabinets are in, countertop in, flooring done, mixing tanks stand made, QT shelves done. Progress today! 2 20 long QT's are going above the counter top on the long shelf. On the right side the fresh water will be on the top in a 40g breeder, below that will be a 40 g breeder for the mix tank. 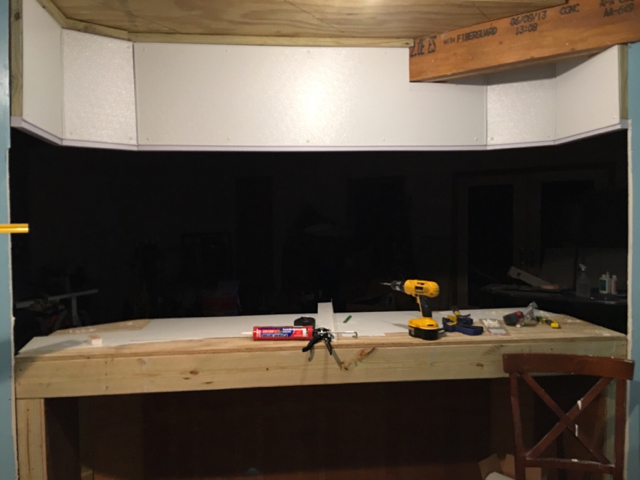 Jeremy will be adding a few outlets and lights. In the meantime, I need to plan out the 125g refugium. I'll have to draw up my thoughts to get your guys opinion. We have lots of LR to put in the sump as the DT is going to be more minimal. I know I'll be doing a section with DSB and macros, need to decide if I want more sections or just the two. Our skimmer and sump are not incorporated with the 125 g. They are separate. I would put the deep sand bed and macroalgae in a separate tank. If the power ever goes out for too long (hours) the DSB can go toxic. As well, algae is not going to be much help unless you have a lot of it, more than you'd want in your sump. I would suggest you keep the sump for filtration devices. Dave, I stated my last statement wrong. Sump is entirely separate. Fuge will be 125g within its own tank. Sump is 30g with an external skimmer. Fuge will contain a section for DSB along with macro in the same section, then next section will be LR without lighting. Very much so!! 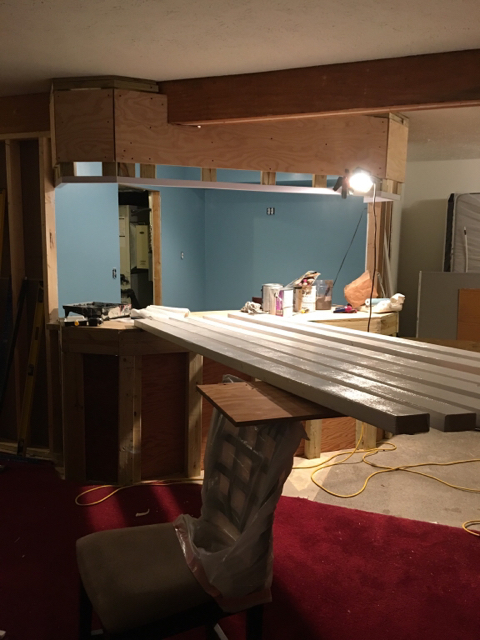 Tank progress is on hold for a minute, we are remodeling the entire house (very outdated, moved in earlier this year). 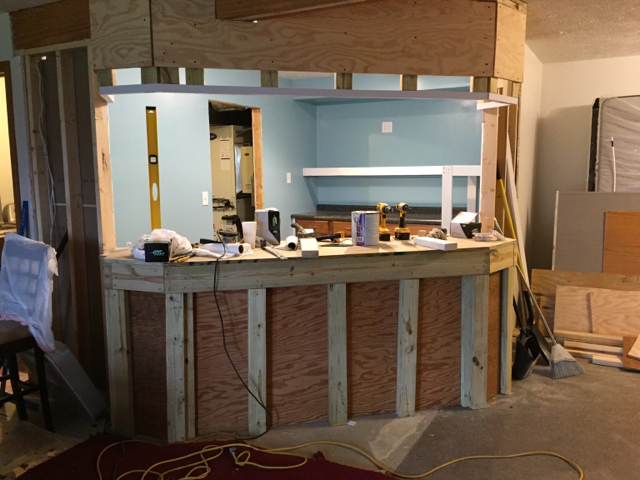 Our great room progress is trumping the tank for this week and next. Ordered furniture and need to get the great room done before it arrives. Kills me to lose two weeks on the tank, but it has to be done! We are considering (technically have decided, just don't want to admit it) on buying two Vortech pumps rather than using the iwaki 70 & 100 that we purchased. A lot comes down to the Vortech is capable for the flow we need, and much more cost efficient to run. I see us ordering these this weekend when we are finally ready to admit we should've just bought them in the first place. On a good note, TTM is almost over. Just did 4th transfer today. After this 72 hours everyone will be moving to a 40g breeder where they'll stay until the large 290 is cycled. DT is remaining fallow. Found a few strands of bryopsis on a frag last night. Hoping I got it all off, if not, I'll be fragging and placing on a new plug. We will see! You are letting your house come before your tank???? What's wrong with you? haha! Haha. It's a major struggle I still can't come to terms with in my head. For the meantime, I made up for the lack of attn to the room.... Jeremy ordered us a custom frag tank and a new custom fuge rather than the 125 that we were going to make into a fuge. Well I know you two have your hands full with all that's going on. It will all work out for you soon and then you can enjoy the fruit of your labor. We are heading back from Detroit now from picking up our 120g custom fuge. It's 36x24x24 and it's amazing. We had a divider installed to separate a DSB from rock area. Also had an 8" x 8" overflow box installed that will have a pump in it for our auto water changes. We originally had a 6' 125 to put under the stand of the 290. 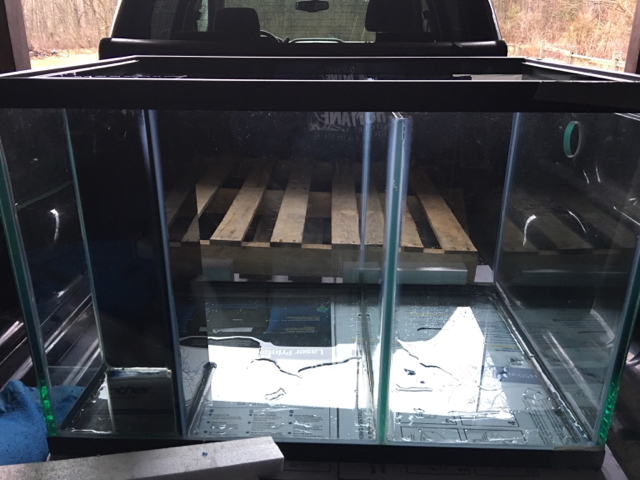 This way, we only lost 5 gallons and gained space under the stand to fit both our sump and fuge. Received notice today our frag tank has shipped. Cannot wait to receive it! We're getting closer. I forgot to add.... Our fuge fabricator made the fuge out of 1/2" glass. Talk about heavy!! How did you produce those labels? Used a generic house label maker. Worked perfectly! I can get the name of the label maker if you'd like. Drumroll please.... Presenting our 120g fuge!! Thanks. I have one already. They look very professional and clean. 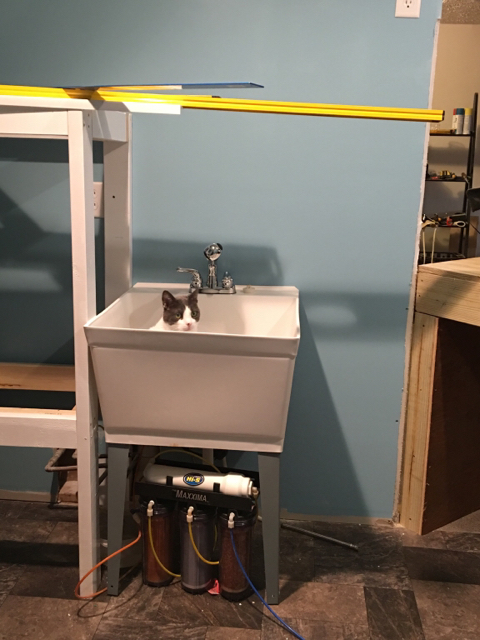 Drew (cat) helped install the sink in the fish room today. 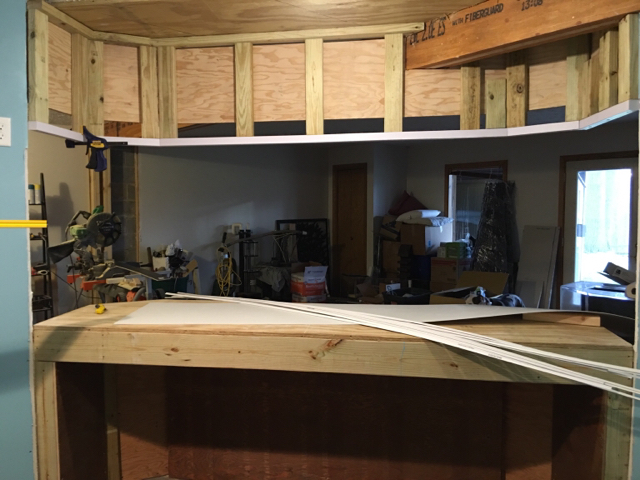 We also are putting up (not sure of actual name) fiberglass paneling above the tank and in the sump / fuge area, and behind the sink. Even though this was for functional use to help water resistance... It looks darn nice too. We got the upper done today. Nice sump and the stand is coming along real well. Terrific progress. Lots of top of the line gear. Very cool that you two are both so into it. My wife likes the tank, but shes not addicted like I am, I am trying to decide if that is a bad thing or a good thing! Keep up the awesome work, I look forward to seeing the finished product. Looking great! You'll be sliding the tank in before you know it!